I've taken a few trips to Cuckmere Haven in recent months to try and photograph an inaccessible pillbox interior through its single embrasure. 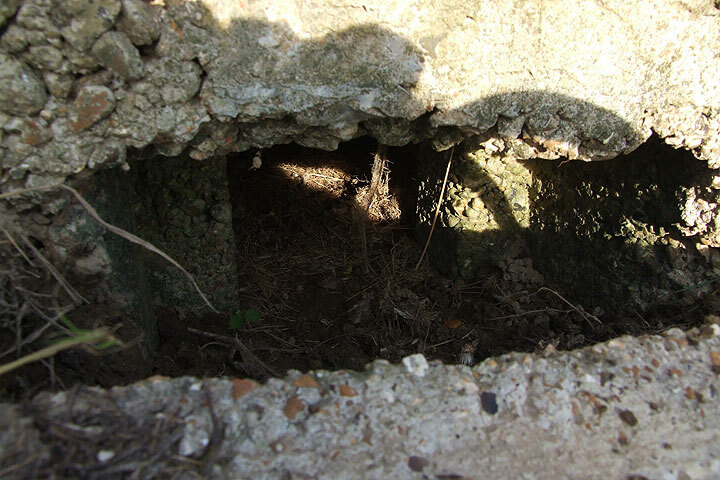 This particular pillbox has been generating a lot of interest elsewhere on the Internet in the past few weeks; the photo below shows everything that is visible above ground. You can also appreciate the problem; the loophole is the only means of access and even this is restricted by a concrete slab and metal hoop intended as a means of obstructing it. This means that you have almost no direct line of sight through the embrasure. The location of the entrance is not yet known. 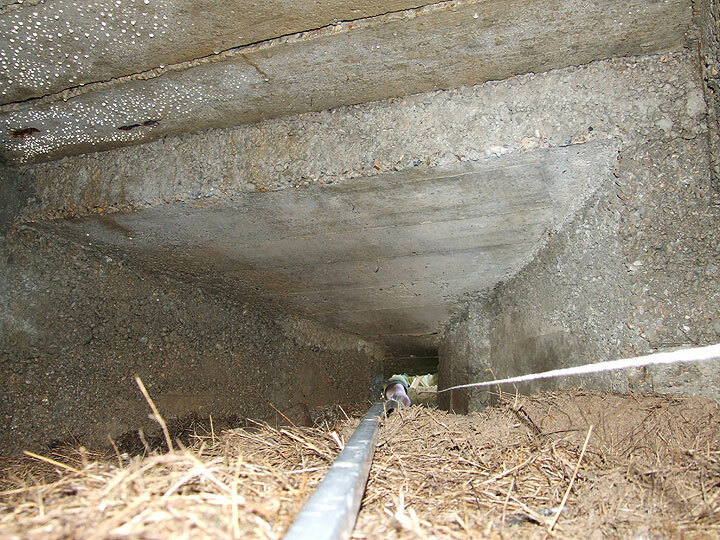 The photo below shows the embrasure close up. The only way for me to really see into the interior was to manouevre my camera down into the embrasure and flip the screen up. Even the mirror-torch seen at right did not prove of any real value because of the very limited line of sight. 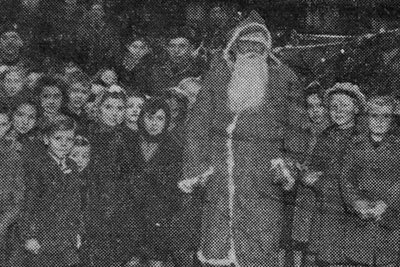 Although the device went inside quite happily, actually being able to see the mirror was almost impossible. This photo was taken on a second visit; I was determined to somehow photograph the interior and get some measurements if possible. 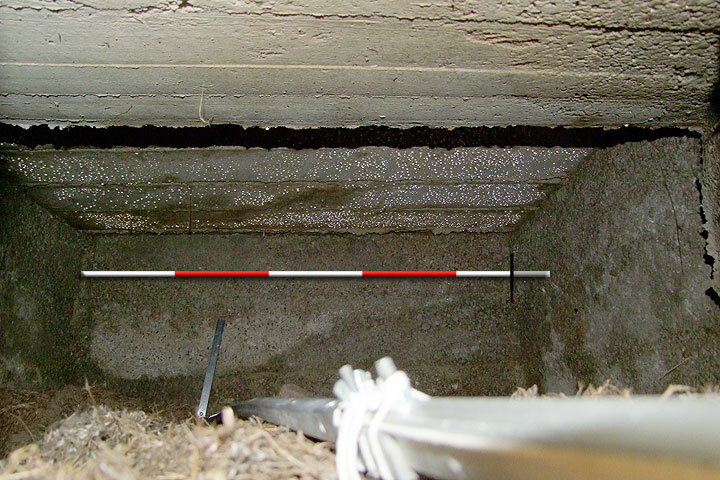 The photo below demonstrates how the interior could be photographed through the embrasure quite easily; we see here the side and rear walls, which are plain and do not indicate the location of the entrance. 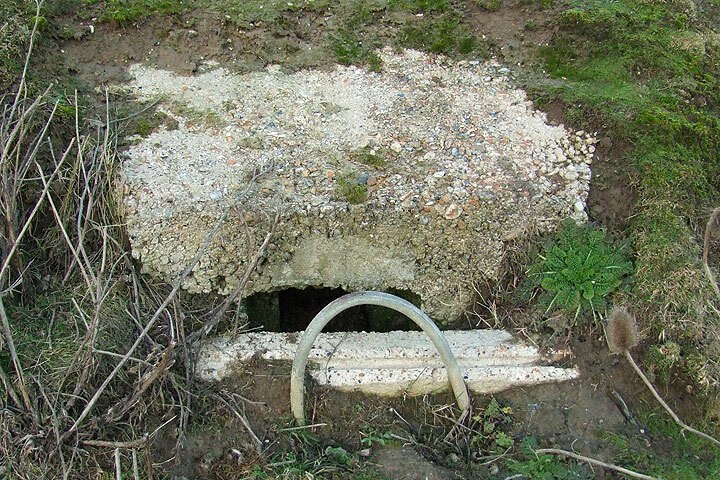 It is also evident how the pillbox has been backfilled with spoil when it was sealed up. This photo was actually only taken to assist me with measuring; I needed to know that the tape measure was touching the rear wall and not buckling up. The shadow being cast on the ceiling also indicates a 'step' being present. However, what I really wanted was to get a photograph from inside the pillbox looking outwards, not from outside looking inwards. 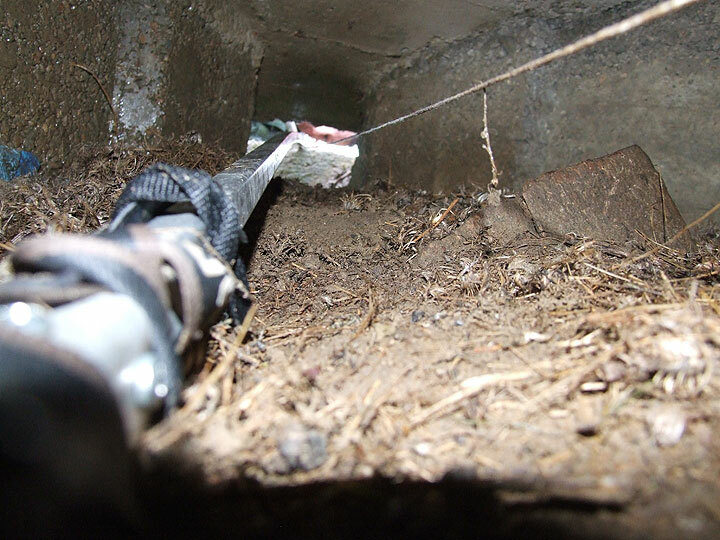 I remembered the success I had with my improvised 'Trenchcam' which involved attaching my camera to my hiking pole and lowering it down into a sealed trench. This time, however, I used the camera sling to strap it to the pole across the handle, facing down the shaft. I tied some string to the camera in order to extract it should it fall off the pole - at this stage losing the camera was a major fear. I was actually using my old camera on this occasion as I'd forgotten to charge the batteries for my best one. This was advantageous as the best camera is too big and too valuable to go through the embrasure. I wanted to get even further back into the pillbox though; a longer implement was obviously needed. The weapon I chose was the fearsome device seen below; this is an 8-foot (2.40m) long piece of hollow box-section with a camera mount at one end. 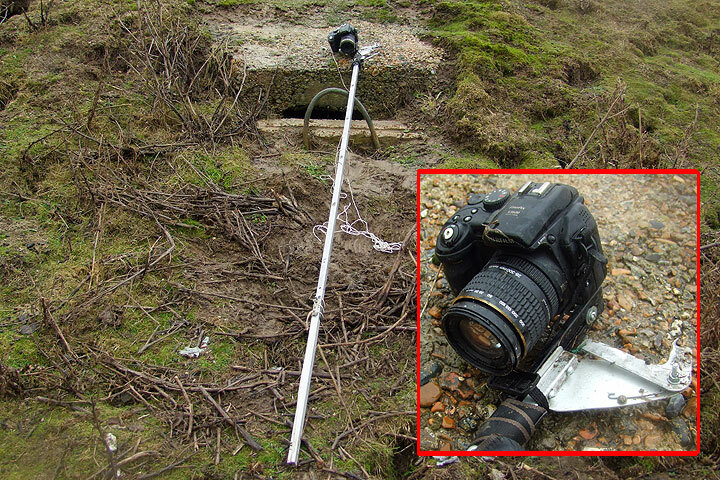 The camera was screwed in place and the sling wound around the shaft for extra stability. The lever system seen was an ingenious shutter release mechanism designed for a previous project and different camera. The day I chose for this was good from the point of view that the mile-long walk from car park to pillbox carrying the pole would result in my not encountering anyone else. The bad point was that this was because there was still snow on the ground and it was raining heavily. I attempted several pictures, but was frustrated by the lack of stability in my modified mounting. The photo below was the best of the day and no better than the hiking pole photo above, despite getting further inside. Proceedings came to an end when the shutter release button developed a problem; it would still take photos normally, but not on the timer, probably due to a problem with the spring. However, I was not put off by this failing and went home to conduct a post mortem on the process. I discovered that the timer still worked with a cable release (and this turned out to be less fiddly than trying to press the button anyway) and some modifications to the camera mount itself were needed. One problem I encountered was that the camera was mounted too low on the pole so I devised a means of being able to change the angle by using a nut and bolt to raise the lens. I also made the platform more stable by removing the unsightly camera sling and replacing it with a length of cord that provided greater security. The unfortunate thing about my second visit with the pole was that not only was it a Sunday, but it was the first day of real sunshine since the recent heavy snow and rain and Cuckmere Haven was absolutely buzzing with people. This meant that I attracted a lot of stares from bemused walkers, and my hat and dark glasses did nothing to introduce any perceptions of 'normality' into my appearance, apparant intentions, fashion sense or mental stability. 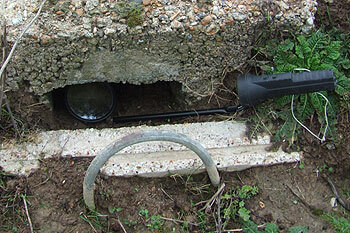 The first experiment of the day was to measure the internal width of the pillbox. I intended to do this by introducing a known scale to the rear wall, taking a photograph and then deducing an approximate width from it. 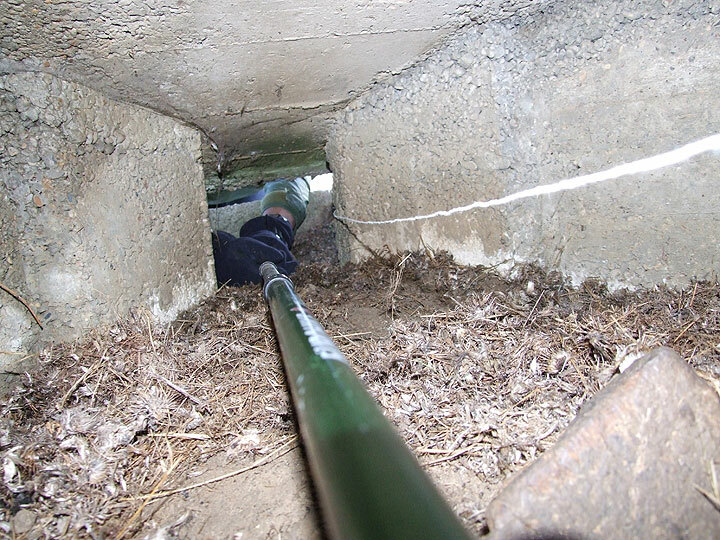 I bolted a 30cm metal ruler vertically to the end of the pole; it proved somewhat tricky getting it through the small embrasure, but I eventually managed it. After several attempts I managed to get the photo below; the flash has illuminated water droplets on the ceiling. Using Photoshop to measure the length of the ruler, I created the ranging pole effect to show that the internal width is approximately 1.50m in width. Note how the camera pole begins to bow under its own weight. 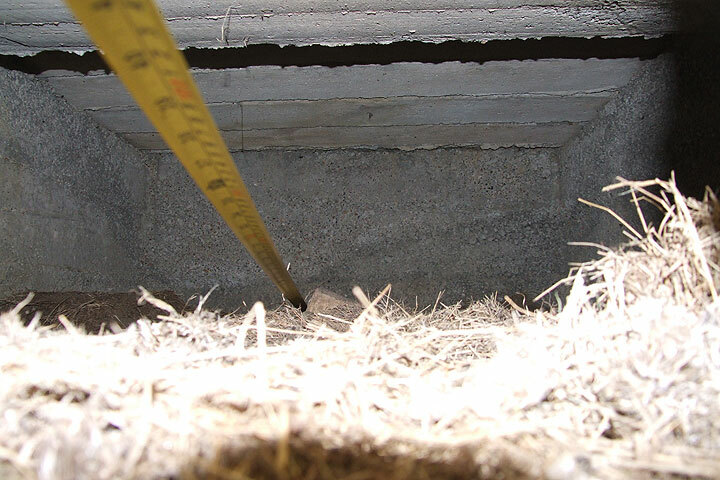 Let's look at the embrasure first. It seems from the photographic evidence that there is a similarity with the design employed in shell-proof Type 24 pillboxes along the GHQ Line. The image below shows a line model of a 'naked' embrasure with s**ockets to accommodate the Bren gun tripod. On the right we can see the sort of shape the wooden former used to mould the embrasure would have taken (the tipod leg s**ockets seen were probably created seperately). This shape is hidden from normal view as it would be surrounded by 3 feet of concrete with brick shuttering, but the tapering nature of the embrasure is evident in the Cuckmere Haven pillbox and explains its odd outward appearance. 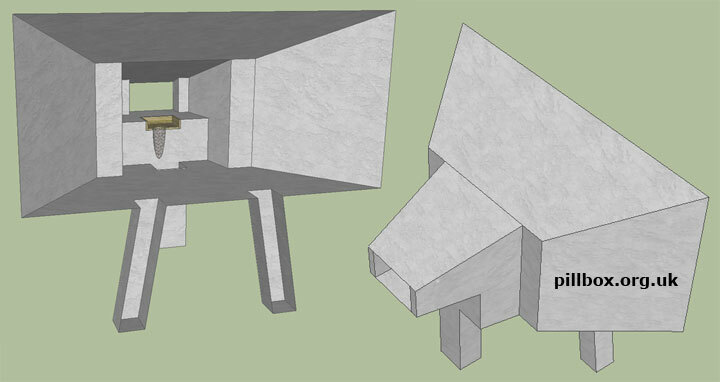 Using the embrasure model from the Type 24 pillbox, I realised that my estimated internal width of the pillbox was only about 20cm short of the average width of a Type 24 embrasure (which vary even in the same pillbox from about 168-175 cm) and so I constructed the model seen at right. This is very much open to interpretation, but the embrasure holds the key. 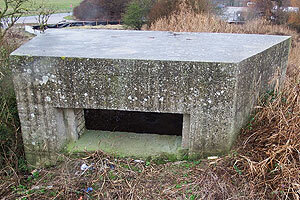 I believe the aim of this pillbox was to house a Bren gun on a tripod to fire on a fixed arc. This statement is based on the embrasure design (the portion of which we can see at least), that indicates suitability for this. 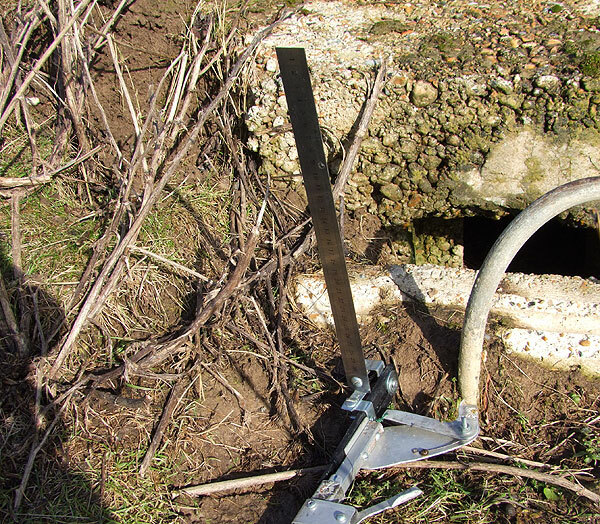 Without the need for a tripod, such a complex embrasure is unnecessary, and a much simpler improvised loophole could have been employed as is seen elsewhere at Cuckmere Haven. The nearest Type 24s using this embrasure design were probably on the GHQ Line in the Ouse Valley, so the embrasure is 'alien' to this area. 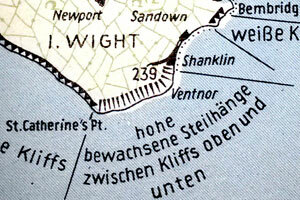 It would seem to have required a bit of effort to introduce here and an odd choice given that it was not employed in a shell-proof pillbox of the sort for which it was designed. What of the entrance? There is no evidence of it, though it is most likely to have been in the rear wall. 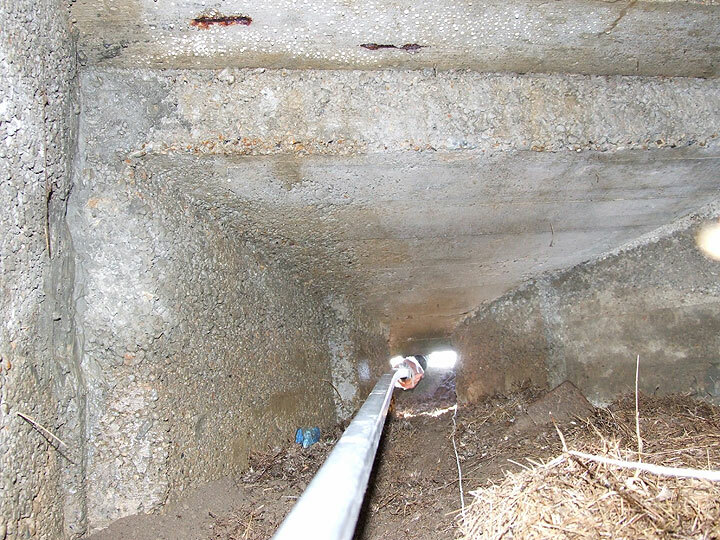 The level of backfill is just above the embrasure sill and the entrance is probably set below this level to avoid daylight being seen through the embrasure from the beach. 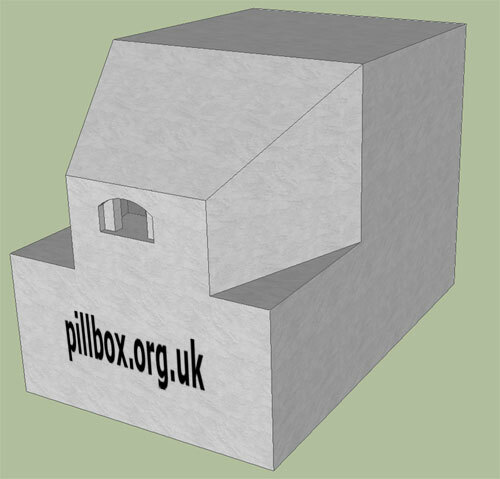 All in all, an interesting exercise in which I've reconstructed a pillbox, most of which is not visible to casual observation. 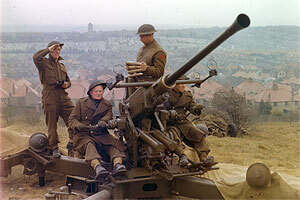 Some simple exploration has indicated that a Type 24 embrasure (not seen elsewhere in the vicinty) was seemingly employed to accommodate a Bren gun tripod. Of course, this is based on what can be seen and it may yet prove to be wrong. 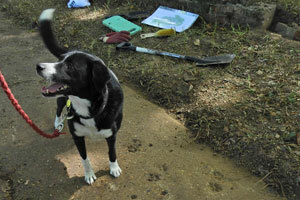 With a lack of documentary or oral evidence, only excavation of the interior will prove or disprove this theory, but it goes to show what can be achieved with a little imagination and ingenuity applied to fieldwork!